The Paykan abides. Article written for garagisme. The car is one of the few liberating spaces one possesses in Tehran, a closed protective environment that can be used as an outlet for the daily frustrations experienced in Iran. Before the Revolution, the paykan, like many other cars in the West, signaled modernization and upward social mobility; now it’s much more. It’s a symbol of Iran and a vivid relic of the past. Today, the car is one of the few, if only places where you can let loose: play your music, curse loudly or exchange a phone number with the neighboring car when stuck in traffic. The car is a lived-in space. 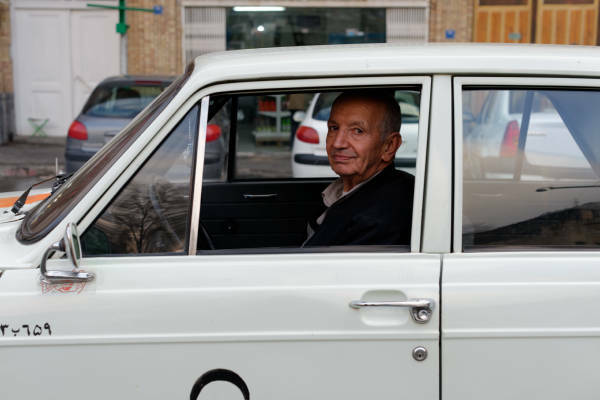 Paykans, at one time, were ubiquitous on Iran’s roads, at least the ones that were instantly recognizable. The taxicabs were orange with a blue stripe or white with an orange or blue stripe similar to a Zip painting of a car. In Iran, everyone knows Paykan. I met Shahin Armin in Lavassan, in the countryside that is slowly becoming an extension of Tehran. He had his blue BMW parked and I was amused to find out he did own a Paykan but in Detroit, at a time when he worked for Chrysler. He explained that that his fascination or obsession with paykan started once he left Iran for the United States. While doing his research on the car Armin found little and so he started a blog, PaykanHunter, tracing any information he could find on paykans. Photos of different surviving relics have been found in a variety of places such as Malta, New Zealand, or the United States. As a child I remember sinking into the backseat. Surprisingly, the Paykan is, in my opinion, more comfortable than today’s Pride or Peugeot, the most common cars in Tehran. The door handle of the Paykan had a fascinating effect on me, similar to a claw but with a soft button next to it. I tried to open it with ease but invariably failed. Throughout the years, visiting Tehran, I noticed the decline of the Paykan. But it was not until I moved here that I realized how rare they have become. The Korean “Kia Pride” and the “Samand”, the Iranian version of Peugeot, have replaced them. When I spoke to Shahin Armin, he deplored the state of Iran’s car industry today. Paykan is the most emblematic Iranian car, without being really Iranian and the cars we see today are hybrid second-rate versions of European cars. For example, the “Samand” is based on the Peugeot. At its inauguration ceremony presided by the Shah, the car was advertised as a completely Iranian creation. The result of which still lingers today as very few know its western pedigree. The Paykan is perceived as the most Iranian car even if in reality it was only assembled here. It almost monopolized the market for 46 years. Of course other cars were manufactured and sold in Iran. Due to its affordable price paykan, became the equivalent of Volkswagen in post war Europe. A mythology similar to Barthes DS could be written about it. Barthes compared modern cars to Gothic cathedrals, made by anonymous artists with the purpose of serving many. The DS or the Paykan is not seen as a mechanical prowess but a domestic tool. Since its initial production 2.3 million Paykan rolled off the production of Iran National. To understand this Iranian symbol one has to travel back to its origins, not in a province outside of Tehran but in Kent, the southwest corner of Great Britain. The Rootes Brothers, initially just local car dealers in Kent, expanded their business by purchasing a car company called Humber, which included another brand, Hillman. Next, they expanded their firm with two other brands, Sunbeam and Singer. After World War II, Rootes came up with a car to compete with Issigonis ‘s famous Mini, a car named “the Hillman Imp”. Pursuing the imp the Rootes dug themselves into a financial hole , until a few years later when they came up with a practical car, The Arrow. In Persian, Paykan means arrow. Designed by Roy Axe and William Towns with the aim of creating a durable, easy to repair, low cost car, the paykan was a quick hit. The Arrow had seven different names and models, catering to the Rootes’ different markets, the Hillman Minx, Singer Gazelle or Singer Vogue to name a few including the most peculiar Australian name, “The Hustler”. When the Arrow hit the market in 1967, it was mostly known as the Hillman Hunter, its most prolific model. Five months later, it got to Iran through the Khayami Brothers. The Khayami’s had a garage in Mashad and with their high ambitions and the opportunities available with the industry’s boom in the 60’s, they started Iran National today known as Iran Khodro in 1962. William Towns, however, moved to work for Aston Martin and a peculiar detail is that he used the same backlights of the Paykan for the DBS 1968. The similarity between the two cars ends there. The most extraordinary and unexpected event in Paykan’s history was the London Sydney rally of 1968, the longest rally following World War II, a Hillman Hunter won it after a Citroen crashed into a Mini. A small victory but a symbolic one against the mini. After the revolution, during the Iran Iraq war, Paykan’s production changed for the worse. Parts were no longer imported and no two Paykans were of the same quality. As soon as someone bought a Paykan he would take it to a repair shop. The spare parts were cheap and easy to find. Even if the parts worked, people often preferred replacing them with imported parts. While Peugeot and Renaults infiltrated the market, people trusted the paykan more, since anyone could repair it. A reflection of the hard times the country was going through, owners of paykans would pick up passengers for a modest fare, something called “mosaferkeshi”. White Paykans of average quality spread, white being the cheapest color for a car. The little status it had, now a thing of the past. In 2005, Paykan’s production came to a halt. One of the reasons for its discontinuation seems to have been that burning fuel at 12 miles to the gallon the car was environmentally unfriendly. In addition, everyone from the government to the local Iranians expected industrial progress and the paykan was an outdated stigma of a bygone era. The automobile industry has always been central to Iran’s industrial development. However, the paykan is making a come back in the collective memory. Not only present in films, it was the subject of two recent exhibitions. At Dastan gallery, the exhibition consisted of a half burned paykan found in a junkyard whose different parts were appropriated by different artists. Aun Gallery had a group exhibition around the paykan, with a John Chamberlain like crushed car. The inclusion of paykans as part of art says a lot about its growing cultural significance. In a country where few want to be associated with the current regime’s symbols, Iranians are proud of their paykan and it belongs to their identity. On Paykan Hunter, Armin’s blog, he puts these different photos of Tehran up with the caption “Spot the paykan”. Photos from the past count endless paykans. It is today with their diminished number that the game becomes more interesting. The origins of the paykan might have been Western but it is in Iran that it took its importance. Thus, the paykan abides for now.